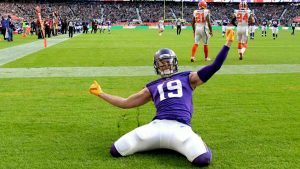 Two-time Pro Bowl wide receiver Adam Thielen has agreed to a four-year contract extension with the Minnesota Vikings, the team announced on Friday afternoon. The Vikings’ front office continued their tendency of rewarding players with lucrative extensions years before their contracts are up. Thielen, who had two years remaining on the four-year extension he signed in March 2017, had outplayed his current contract — which was set to pay him around $8 million in 2019. He will now be making an average of $16 million per year. Thielen’s rise from an undrafted free agent who joined the Vikings after a rookie tryout in May 2013 has been well documented. The Pro Bowler is coming off back-to-back 1,000-yard receiving seasons, marking a career-high 1,373 yards (fourth most in franchise history) and 113 receptions (third most in franchise history) and nine receiving touchdowns in 2018. According to the NFL Players Association public salary-cap report, the Vikings have just over $2 million in cap space. Before Thielen signed his extension, the wide receiver was on the books with an $8.1 million cap hit for 2019. It’s possible that his number remains close to that, even with the extension, but it could be lowered, allowing the Vikings the flexibility to make other offseason moves and pay their draft class later this month. With Thielen’s new deal expected to keep him in Minnesota through the 2024 season, the Vikings get to retain one of the league’s best receiving duos. Both Thielen and Diggs were the first Minnesota wideouts to both reach 1,000 yards receiving in the same season in 2018 since Hall of Famers Randy Moss and Cris Carter achieved the same feat in 2000.